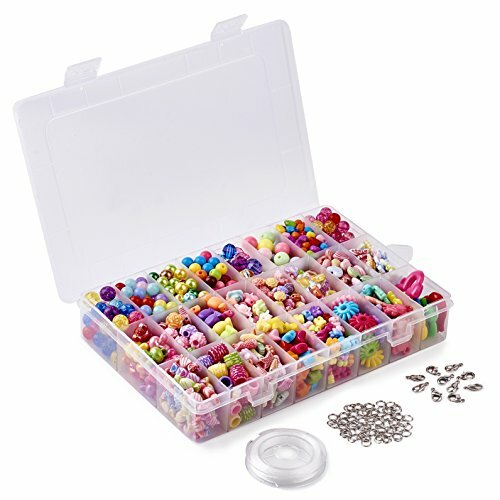 A reusable storage container which is separated into 24 compartments to keep crafting beads organized. The combination of pretty look and wide use make it attractive piece to trendsetter. WARNING: CHOKING HAZARD -- Small parts. Not for children under 6 yrs. Not suitable for children under 5 years old due to small part or parents need to play with your kids under 5 years old. The use of those beads is widespread that can feature pendants, jump rings, chains and other fancy accessories. ♥ Great for kids adults toddlers children to improve the creative ability, imagination, logical thinking, hand-eye coordination, beginning ability. ♥ As a great gift for Kids' birthday, Halloween, Thanksgiving, especially for Christmas! If you have any questions about this product by Beadthoven, contact us by completing and submitting the form below. If you are looking for a specif part number, please include it with your message.